Negotiations between Stop & Shop and the UFCW local unions continued Monday, five days after workers first walked off the job and onto the picket line at all 90 stores in Connecticut. Striking employees are scheduled to receive paychecks on Wednesday. While some stores are staying open with minimal staff, the Whalley Avenue Stop & Shop in New Haven is closed except for the Peoples United Bank. Normally, Cathy Conklin from Hamden doesnt shop at Big Y. I do my grocery shopping at Stop & Shop in Hamden and stop and shop in North Haven, she said. But Conklin explained she refuses to cross the picket line. I dont want any of their benefits to be cut, if anything they should be getting an increase in benefits because of the increases in prices, she said. Hmmmm. Higher benefits in a industry with mostly low skill work, complains about high prices. I wonder if there is any correlation? By "benefits cuts" they mean a raise each year, unless you reach the top of you pay scale than you get a $1,000 bonus, a 100% employer funded pension and the worst part having to pay $30/wk for Gold level FAMILY insurance, instead of $26/week like they do now. Seems like a legit reason to strike, right? I used to go to Stop and Rob, but since they’re on strike I’ll go to Shoot and Save. If there's a Market Basket near you I would recommend them without reservation. It would appear to me the strikers are getting a nice dose of reality when they talk among themselves, such as "blue." Action have consequences. 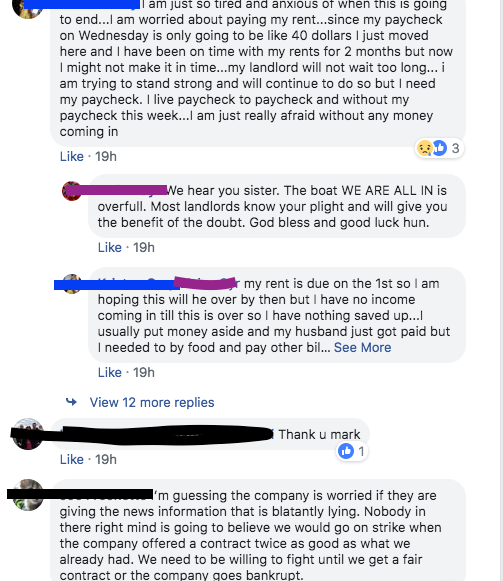 Maye you union bosses could front you the rent, you know being "bothers ans sisters," right? Or Black line, no sane person will believe you when the company posted their actual proposals online for anyone to view. I'm guessing they are happily drinking the union kool-aid saying "company bad union good! REEEEEEEE!" The irony of the Union employees on strike, actually telling people to go to the almost exclusively non-union competition. Here in CT besides S&S we have many a dozen unionized grocery stores. The price difference between the supermarkets in CT and where I live in NH is breathtaking. Don’t think I ever been to a supermarket in CT. Would occasionally hit the supermarkets in Seabrook and Nashua, though. How much do they pay to the filthy union to pass on to democrats? I was in BigY in Westbrook and the place was swamped. Ill probably never go back to S&S again. Good question. First they have to pay the union bosses their 6 figure salaries and other benefits. I was talking to a Big Y employee recently, they said that they have had numerous in-person conversations a phones calls to stores and their HQ from S&S shoppers who have said they are done with S&S. Just like socialism. It appeals to the terminally stupid, and always ends the same way. Unions are a cancer. They consume a host, they destroy an industry, all the people lose their jobs, and the union bosses get their money and go somewhere else to spread their cancer, another industry. Look at the steel industry. Look at the auto industry. Ruined by unions, or in the case of the government, made worse by unions. Scum. I don’t blame most union members, they often have to be union members to make a living. I hate unions. Yeah. I forgot to mention the fate of Hostess. Hostess was my favorite union screw up. Literally all but one union agrees to make changes to keep the company, which was on the verge of bankruptcy afloat and the baker union goes nope. Now take backs! Aaaaaannnd, they all lost their jobs, only to be replaced by non/union companies who bought the remains. Most are dirty and poorly maintained, So in the last year so they have completely renovated several of their stores and at one point he had plans to do more of them. No idea how that will pan out after the strike its over. I can Go to big Y and pay similar prices to Stop and Shop, but get better service and quality. Or I can go to Target, Aldi, WalMart, etc and better prices. Stop & Shop, pay higher prices, get poor service need to be their motto. I was FORCED to be a member of the UFCW, when I worked for Caldor and Ames...my dues for the right to be a union member was half my paycheck when I was in high school and 15% when I was in college...The union was always telling us to vote for Dems...I told my union leader that I won't, he told me they won't help me if I didn't. Hostess was my favorite union screw up. "Hostess was my favorite union screw up. What people don't realize is that Eastern Airlines actually chose the union. The CEO of Eastern in the 1950s, Eddy Rickenbacker (very famous WWI Ace- highest number of German planes shot down by an American), recognized that Eastern was going to be unionized, so he did his research and chose what he considered to be the best union and approached them. Well, the years go by, people change, and the rest is history. On a side issue, he was conservative and in the 1930s he actively opposed Pres Roosevelt to a degree that NBC censored Rickenbacker's comments about the President.